I’m not giving up red or white. I’m not giving up sweets, trashy TV, gossip or coffee. Been there, done that. In fact, I might even drink more, watch more Shark Tank, eat more sweets, dish on the neighbors, and hit the latte bar. Seriously, you know, I’m a righteous soul. I’ve got to do something for Lent. wine in the Adirondacks. waiting for summer. *These last two were inspired by Pastor Andrew’s sermon a couple of weeks ago at Rutgers Church. If you want to join the decluttering challenge and do some synchronous cleaning, I can add you to a super-secret Facebook decluttering group. Just message me. I want to blog more because I have been learning so much through starting my own business. I want what I’m learning to be useful to other people. And why travel? Just because. I’ve been a little down this week. And travel always makes me happy. In fact, I’m writing this from beautiful Nokomis, Florida. (Thanks, Nicole and Brendan for hosting me!) Next week, the family and I will be on spring break at Circle Z dude ranch in Arizona. Then, just my son and I head to Charlotte, North Carolina to look at colleges for him. While in Charlotte, I’m offering a really fun and creative workshop, Spiritual Journeying, with Cindy Sloan. We’ll be making collages and writing about moments from our lives. 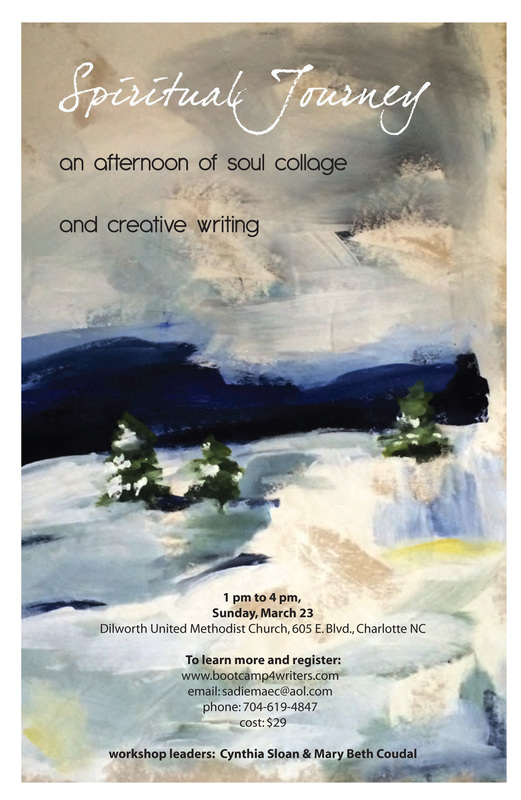 We’re offering the workshop on Sunday afternoon, March 23 at Dilworth United Methodist Church ($29). Please come and tell me what you’re giving up for Lent. Or if, like me, you are just giving up. Thanks, Hal Sadler, for this awesome ad for us! have fun on all your trips!! So jealous. I smiled when I read this. My daughter just told me that she’s given up processed sugar for Lent; I laughed and asked her whom that would benefit most. I told her that I decided that instead of giving up this year I was going to try to be more giving. I like your idea of putting myself on the list of people to whom I could be more giving. Enjoy your travels! I give stuff up, but not for lent!